This large bore blower duct is a flexible PVC ducting suitable for air conditioning, heating and ventilation applications. Ideal as temporary or permanent ventilation for marquees and buildings, and extensively used as air conditioning duct for aircraft servicing. 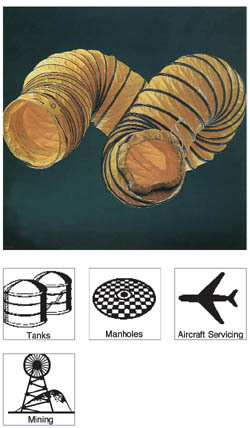 Blower Duct is lightweight, extremely flexible ducting. Constructed with a PVC coated reinforced material with an external vinyl wearstrip. Ideal for portable ventilation units to service man holes, tanks, marquees etc. Colour: Yellow/Black Spiral.